Book at least a two night stay, now through the end of March 2019 and receive a 10% discount with Hurd's Fishing Guide Service! Contact us for details, subject to availability. If you're looking for the absolute highest level of luxury and seclusion available in the Coulee, we have the property for you. Red Rock Shadow Ranch is a premiere private residence on four acres, conveniently located within minutes of prime hiking, beaches, fishing, Banks Lake and Steamboat Rock. We feature stunning views; premium furnishings; a fully equipped gourmet kitchen; gracious outdoor kitchen, seating and dining; amenities such as Keurig coffee and Aveda products; and more. Enter this contemporary 2,700 square foot home through an arched entry into a the spacious tiled hall and carpeted living room. Soaring vaulted ceilings and oversized windows frame a stunning view of Steamboat Rock. Relax around the exotic-wood coffee table on premium leather seating for six. The media room, just off the living room, features a plush and comfy couch and oversized coffee table, perfect for setting up board games. While there is no cable or satellite in the house, the app TV is ready for streaming from your device. Game on the Xbox 360 (bring your own game or try one of ours) or choose from a selection of classic board games. When it's time to eat, enjoy cooking in the fully appointed stainless steel and granite kitchen featuring a large island, full refrigerator, double convection ovens, walk-in pantry, dishwasher, microwave and a 5-burner gas range. The kitchen comes equipped with all the cooking utensils you need to make that special meal, including pots, pans, knives, measuring cups, cutting boards, etc. There is also a toaster, Keurig coffee maker (along with a selection of coffee, tea, hot chocolate, cream and sweeteners), and food processor, and ample serving ware. The kitchen is completed with service for 12 including stoneware, silverware, glasses and wine glasses. Enjoy the spectacular view of Steamboat State Park and Rock from the dining room table, which seats up to 8. The dining area is conveniently located off the kitchen. Entertain your friends and family outdoors on the main patio that features an oversized couch and two chairs or lounge by fire pit nook, both with spectacular views of Steamboat Rock and Banks Lake. You'll also find an outdoor kitchen with BBQ, Traeger smoker and fridge next to the dining area that seats six. For evening meals, enjoy ambient outdoor lighting. Three bedrooms are conveniently located away from the main living areas with a fourth bedroom off the kitchen. One king, one queen and four single beds are all appointed with Ralph Lauren or Hotel Collection bedding, including duvets. Each bedrooms is uniquely decorated in serene shades of gray, cream, blue and brown. The lavishly tiled master bathroom is equipped with a large jetted tub, heated tile floors, dual vanities, two-head shower and two spacious walk-in closets. Two bedrooms share a Jack-and-Jill bathroom, with a tub/shower combo. The powder room is adjacent to the living room. All bathrooms are stocked with Turkish cotton towels, including oversized bath sheets, and Aveda Rosemary Mint products. A premium Super Solano hair dryer is located in the master bathroom. For longer stays, enjoy the convenience of a full size front-loading washer and dryer in the mud room off the kitchen, stocked with a selection of detergents and dryer sheets. An ironing board and iron are also available. In the garage you have access to a second full sized refrigerator. In addition to the ample parking area next to the house, take advantage of the lush grass in the front and back and yard. The property is not suitable for pets of any kind. We have made exceptions in the past that caused extensive damages and we apologize but will not make any exceptions. Minimum renter age is 30, with positive reviews. If you do not have any reviews please contact us first. Maximum occupancy is 6 adults and two children, or a total of 8 people. Two of the beds are bunk beds and not suitable for people over 135 pounds. We're lifetime residents of the Pacific Northwest and currently make our home in Snohomish, WA. We love to spend our time traveling, entertaining and outdoor living. 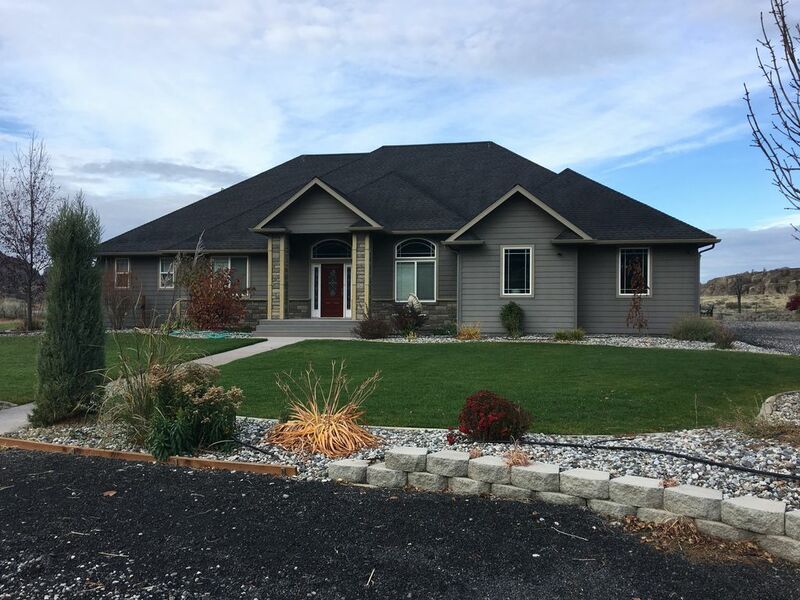 We've been vacationing in the Grand Coulee for many years and had our eye on this property for its superb location and lovely home. We spend as much time at the Ranch as we can, but due to our busy jobs, our windows to visit are limited. We're delighted to offer others the opportunity to enjoy this very special area from our home. This property is located on the shores of Banks Lake, one mile from the Northup boat launch, two miles from the Grand Coulee airport, 2.5 miles from Sunbanks resort and close to great swimming, hiking and shops. The house sits adjacent to the state park and Jones Bay. The bathrooms are fitted with premium fixtures and comfort height toilets. Each bathroom is stocked with Turkish cotton towels and Aveda products. The master suite features an oversize shower with dual shower heads and a separate jetted tub. His-and-her vanities have granite countertops and there is ample storage space. The tile floor is heated. The jack-and-jill bathroom is shared by the queen and twin bedrooms. It features a shower/tub combo and private vanity for each bedroom. The tile floor is heated. A powder room is conveniently located off the main living area. Hot water is provided by two separate, large tanks to ensure you never have a cold shower! Situated at the edge of Steamboat Rock State Park, you'll enjoy a spectacular view of Banks Lake. Stunning mountain views can be enjoyed from every room in the house, including the best view of Steamboat Rock in The Grand Coulee. The entire house is air conditioned by heat pump. The entire house is heated by heat pump. All beds are fitted with premium Hotel Collection or Ralph Lauren high thread count linens. Large-capacity, front loader with multiple options. Laundry detergent provided. Large-capacity front loader with multiple options. Dryer sheets are provided. Enjoy the outdoor, propane fire pit. Ample parking. Bring all your vehicles and toys! The gravel parking area is adjacent to the house on flat ground. The wide open space allows for easy maneuvering for your towed watercraft. Two-car garage is available for your use. High-speed WiFi is available in every room and on the patio. Each bathroom is stocked with an ample supply of Turkish cotton bath and hand towels and washcloths. We also have Williams-Sonoma kitchen towels. Enjoy a stunning view of Steamboat Rock from every seat in the living room. We feature Restoration Hardware, leather sofa and chairs, along with an oversized exotic wood coffee table. You'll enjoy the convenience of three refrigeratros: a stainless steel refrigerator in the main kitchen; a second full-size refrigerator in the garage; and a smaller refrigerator on the patio. Five burner, gas stove with pot spigot, food warmer and dual variable-speed fan. Keurig K-475 coffee maker, including a variety of coffee, tea and hot chocolate drinks and sweetners and cream. The Keurig can also accomodate your own ground coffee. 4 piece toaster with variable settings. Pots, pans, knives, measuring cups, cutting boards, etc. -- everything you need to cook that special meal. We have ceramic non-stick sautee pans and a variety of premium stainless steel cookware. Complete with service for 12 including Mikasa stoneware (dinner and salad plates; cereal and soup bowls; mugs), silverware, glasses and wine glasses. Plus a variety of platters and bowls for serving. When it’s time to dine, enjoy cooking in the fully appointed indoor and outdoor kitchens. Dine inside while enjoying the spectacular view of Steamboat Rock from the chic dining room table, which includes two benches and two captains chairs. Or dine outdoors on the patio (seating for six). Please note: There is NO CABLE OR SATELLITE service at the Ranch. However, we have provided a smart TV in the media room that you can easily connect your electronic devices to for streaming content. Enjoy streaming media and playing games in the cozy room, conveniently located off the living area. We offer a variety of board games, suitable for all ages, in the media room. The kids are welcome to play on our lush lawns, which surround the house. Enjoy a stunning view of Steamboat Rock from the Trex deck, which features seating for 5 and low-voltage lighting. Additional seating is available at the fire pit area and patio dining area. Daily housekeeping is available for low rates. Please ask when booking. It was absolutely perfect! Even better than the pictures and description! Clean, beautiful, great outdoor areas, lots of extras including Keurig and pods, bbq, smoker, shampoo/conditioner/body wash, nice washer/dryer and a super prompt and communicative owner!!! By far our best lodging and experience in our 30 years of vacationing at Banks! House has an amazing view and they have thought of everything even the kerig! The beds were very comfortable, there was a nice selection of board games our kids enjoyed, and the wild life around the house was a treat. We highly recommend this home for your next vacation! Rented the house for a low key bachelor party get away on the Lake. Cabin was immaculate upon arrival, and the view and amenities were off the charts. The Lake View and back BBQ area was the perfect setup for sunset evenings with the grill and dinner outside. What a beautiful and amazing home. My family and I had an amazing weekend at this property that had everything you would need including a fantastic view of the lake. Book this property, you will not be disappointed. Red Rock Shadow Ranch is conveniently located on the border of Steamboat State Park and Banks Lake. Enjoy boating, fishing, swimming, hiking and more, just minutes from the house.